Dr. James Morris is a is a thoracic and cardiac surgeon based in South San Francisco, California. He graduated from the Harvard School of Medicine and he completed a residency stage at Massachusetts General Hospital. Dr. James Morris is a board-certified specialist in thoracic and cardiac surgery. He contributed to several published studies and some of the topics he covered are the epigenetic modification of the oxytocin receptor gene, adolescents with autism spectrum disorder, social regulation of emotion. 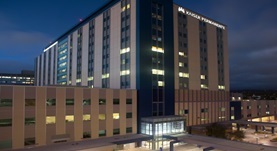 Dr. Morris is affiliated with the Kaiser Permanente Oakland Medical Center. Dr. James Morris has contributed to 3 publications. Epigenetic modification of the oxytocin receptor gene influences the perception of anger and fear in the human brain. Puglia, M. H.,Lillard, T. S.,Morris, J. P.,Connelly, J. J.; Proc. Natl. Acad. Sci. U.S.A.. 2015 Feb 13. Neocerebellar contributions to social perception in adolescents with autism spectrum disorder. Jack, A.,Morris, J. P.; Dev Cogn Neurosci. 2014 Aug 30. Implicit conditioning of faces via the social regulation of emotion: ERP evidence of early attentional biases for security conditioned faces. Beckes, L.,Coan, J. A.,Morris, J. P.; Psychophysiology. 2013 Aug.